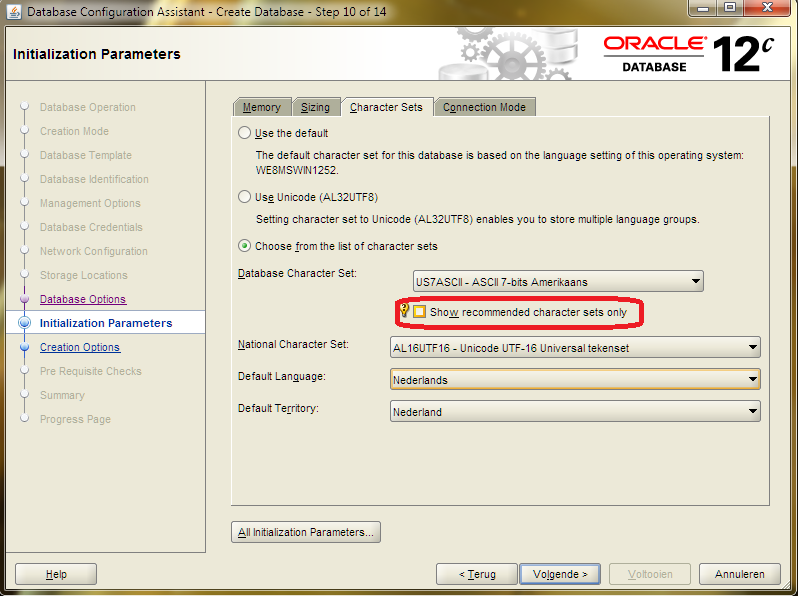 要更改 Oracle Application 数据库的 NLS_CHARACTERSET：请参阅 Note 124721.1 Migrating an Applications Installation to a New Character Set. 一个使用 NLS_CHARACTERSET 为 AL32UTF8 并且 NLS_LANGUAGE/NLS_TERRITORY 为 AMERICAN AMERICA 的数据库能存储日文 (或者从某种意义上说任何世界上其它的语言). 请参阅 Note 333489.1 Choosing a database character set means choosing Unicode 以及 Note 1051824.6 What languages are supported in an Unicode (UTF8/AL32UTF8) database? 所以Oracle一般建议使用NLS_CHARACTERSET, CHAR, VARCHAR2 , LONG 和 CLOB 这样的数据类型,而不是N-类型的数据类型. 详细讨论，请参阅 Note 264294.1 Choosing from WE8ISO8859P1, WE8ISO8859P15 or WE8MSWIN1252 as db character set. 要确保数据库中没有使用字符集相关的数据类型(CHAR, VARCHAR2, LONG, CLOB)来存储二进制的文件(pdf , doc, docx, jpeg, png等文件)或者加密的数据(passwords). 或者像ORA-29275 或 ORA-600 [kole_t2u], 这样的错误就会发生. 如果你想把二进制数据或加密的数据存储在CHAR, VARCHAR2, LONG or CLOB数据类型里,那么它们在application端必须被转换成”characterset safe”的形式,比如base64. 请参见文档: Note 124721.1 Migrating an Applications Installation to a New Character Set. 如果要在现有数据库之间导出/导入特定的用户或表，且其中一个数据库是 UTF8 或 AL32UTF8 数据库，则请参阅：Note 1297961.1 ORA-01401 / ORA-12899 While Importing Data In An AL32UTF8 / UTF8 (Unicode) Or Other Multibyte NLS_CHARACTERSET Database. However N-types are rather poorly supported in (other vendor) programming languages and on application level in general. C5) Physical / Logical Standby 数据库如何操作? 详见文档 Note 1272374.1 The Database Migration Assistant for Unicode (DMU) Tool. 从 Oracle database 12c开始，迁移 NLS_CHARACTERSET 只能使用工具DMU：Note 1418321.1 CSSCAN and CSALTER To Be Desupported after DB 11.2. DMU工具是唯一一个可以用来把pdb从非Unicode转换成Unicode的工具,参照文档note 1272374.1 The Database Migration Assistant for Unicode (DMU) Tool / 13) How to convert non-Unicode PDB’s to Unicode PDB’s? Note 229786.1 NLS_LANG and webservers explained. Note that NLS_LANGUAGE and NLS_TERRITORY have nothing to do with the ability to *store* characters in a database. A database using WE8MSWIN1252 NLS_CHARACTERSET and JAPANESE JAPAN as NLS_LANGUAGE and NLS_TERRITORY will *not* allow you to store Japanese as WE8MSWIN1252 doesn’t define Japanese characters. A database using AL32UTF8 NLS_CHARACTERSET and AMERICAN AMERICA as NLS_LANGUAGE and NLS_TERRITORY *will* allow you to store Japanese (or any other language in the world for that matter).